Knitting on this sock has been very frustrating. I am getting ladders for one, something that I didn’t get on the Frog socks or the Glynis pair. I think I have been holding the needles differently. Then I noticed that the right and left slating 3tog stitches should have been knit so the middle stitch is toward the back, not in the middle. That way the vine would be smooth. Why couldn’t I have noticed it on the first repeat? Also the yarn is too dark to clearly see the vine design. I am going to shelve this pattern until I can buy some light colored sock yarn that shows off the vine, leaves, and buds better. Today I am starting on a different pair. 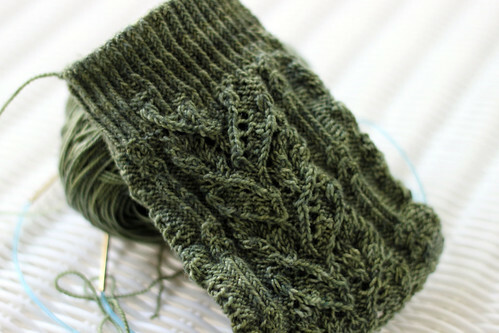 I just hope this time I can knit socks that come close to being what I see in my head. This entry was posted on Sunday, June 28th, 2009 at 3:00 am and is filed under Knitting. Tagged: Knitting. You can feed this entry. You can leave a response, or trackback from your own site. If you have the vision of what you want, you’ll get it! I think it is good that you are putting the sock aside. Life is too short to finish knitting project that are not fulfilling.